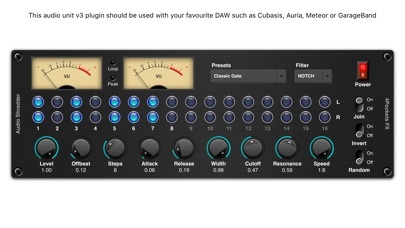 This is a AUv3 compatible audio effect which can be used as plugin with your favourite DAW such as Cubasis, Meteor, Auria or GarageBand. 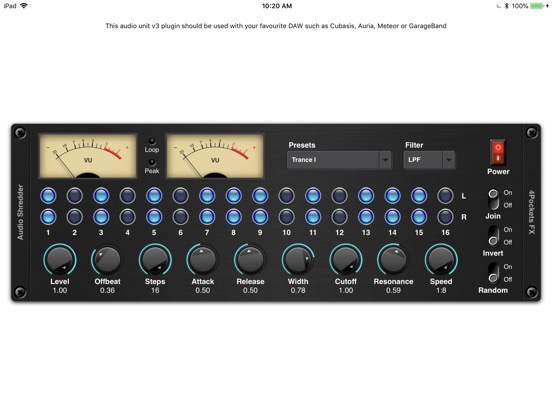 It supports a modern graphical interface and presets with stereo meters for monitoring signal levels. 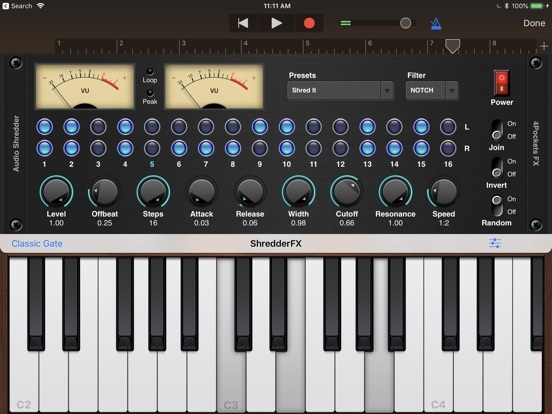 This audio shredder does just what is says, it shreds incoming audio (usually strings or lengthy sustained chords) into bite size pieces, adds an envelope and passes through a filter of choice. 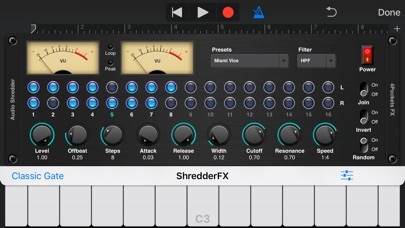 The result is a gated staccato effect which you can shape into patterns or runs of quarter notes. These kinds of patterns can be heard in Trance / Dubstep / Hip Hop or other modern electronic music genres. You can control both left and right stereo channels independently, with control over pulse width, attack and release. There are 4 difference filter types (Low Pass, High Pass, Band Pass and Notch) which can be enabled, with independent control over cutoff frequency and resonance. You can even randomise new settings each step for some incredibly complex and pleasing textures. Each quarter note can be independently triggered or you can join them together to create longer runs. 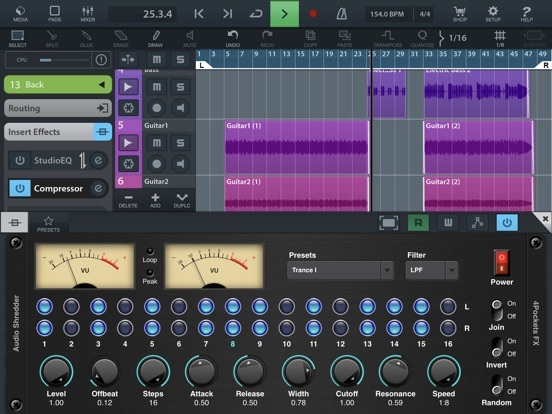 This plugin allows complete parameter automation and auto sync to master tempo. 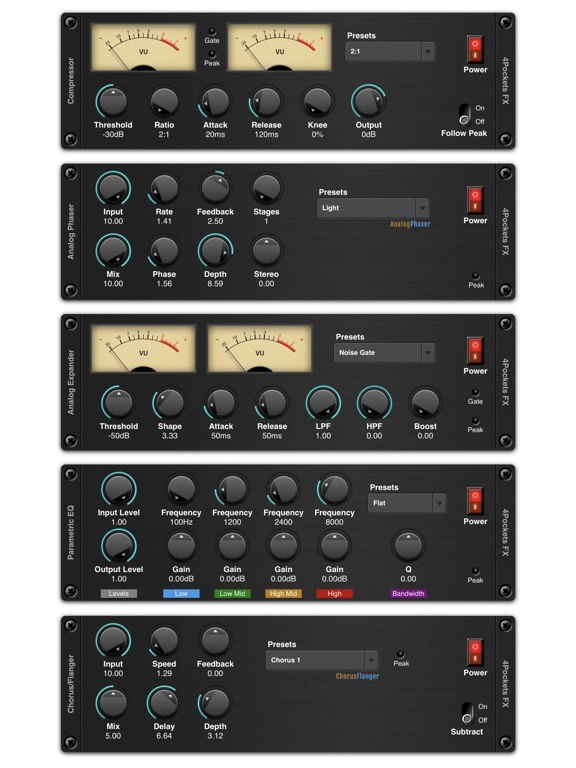 This is one of a suite of AUv3 compatible plugins which will also soon be available from 4Pockets. Fixed an issue loading multiple instances at the same time.